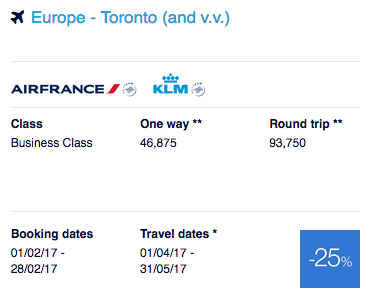 The newest set of Air France KLM's Promo Awards went live today and for us Canadians this set has two cities they serve in our great country! With promo awards the discount ranges from 25 to 50% off the regular amount of miles required to redeem for these flights. As you can see just by the discount this can be a very good offer if you get 50% off for Business Class! However for us here in Canada we don't get any 50% offers once again but we do get 25% off which can definitely be utilized by some! So while 25% isn't as good as 50% of course, it still is something to look at if you were planning travel in the first two months of the year. Don't have all the miles? You could always consider transferring Starpoints earned via the Starwood Preferred Guest Credit Card from American Express to Flying Blue. The card has a 20,000 Starpoint bonus right now which translates to 25,000 Flying Blue miles! 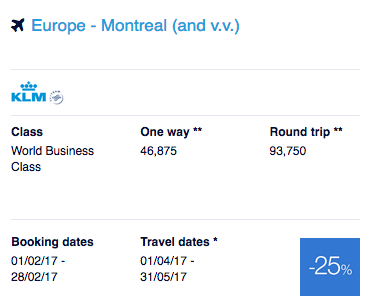 More than enough miles for a one way flight in Economy between Vancouver and Europe. You can add in even more miles with the Marriott Rewards Premier Visa card, its 30,000 point sign up bonus translates to 10,000 Starpoints which means another 10,000 Flying Blue miles.